Home » Desktops & Laptops » 2015, the return of Microsoft? Posted by on | Comments Off on 2015, the return of Microsoft? On February 4, 2014, Satya Nadella took over the CEO role at Microsoft, for many to be one of the most important changes Microsoft deared to do in a decade. Satya is not new to the company, he has been working in it since 1992 and has leaded many projects, among them, the successful Microsoft approach of cloud computing development, Azure. 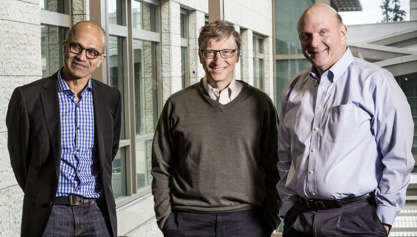 Microsoft has an immense opportunity in 2015. They have several things ongoing, some of them running through Microsoft classic try and fail iterations until they get it more or less right. And their tablet, has already got to their third version, reaching a very good mature point. The new Surface Pro 3, the tablet that can replace your laptop (as they promote it), can actually be getting really close to the device a lot of users and companies were waiting for. A device that can be used as two things, a tablet and a laptop. Easy to carry, with the same applications for both type of uses, with 9 hours of battery life and enough power to do almost whatever you need. Its less than a cm thick (0.91 cm to be precise), and can be used as a full desktop computer with a Docking Station specifically designed for it. Through the docking you can connect an external screen via the Mini Display Port and you can have a full desktop computer. It capable of kicking up to two external screens at Full HD resolution with the i3 version, and up to two external displays at 2880 x 1800 resolution on the models with i5 and i7 processors. This or maybe the next version of it (possibly called Surface Pro 4) combined with a (soon to see) Windows 10, plus the Intel Broadwell processors that might not require a fan at all to keep these babies cool, might be the holy grail for Microsoft in 2015. I guess we just need to wait and see if Microsoft can and wants to be back to compete in the personal computing and corporate environment and shout out loud to Apple, we are back! Maybe 2015 will be the year where Microsoft could make me bring that enthusiasm I once felt for the company, back.